He is the 2012 Futurity Dark Herdsire of the Year! The video is of Huckleberry kids Holokai and Sumbawa winning the Championsip and Reserve championship at NWAS 2011. Our new partners Jack and Kelly Armstrong, the most knowledgable suri breeders we have ever met, now of Pure Suri Breeding Company, have been keeping this boy under wraps. Thats a long story. Suffice to say he's now here and working like a pro! He is a superb representation of superb genetics. A mahogany dark brown "Huck", as we call him, brings double Bruxo genetics in proven lines. Huck was tested by the Watts method to have the highest follicle density of any colored suri male tested to date. He also has an excellent 11.4 to 1 secondary to primary follicle ratio. This boy exhibits luster plus, good fineness, tight uniform pencilling and as his skin biopsy testing tells us, very good density. Its on a conformationally correct frame exhibiting strong bone complimented by Huck's studly presence and regal disposition. "Huck's" 2010/2011 production has been amazing. We should have used him more! 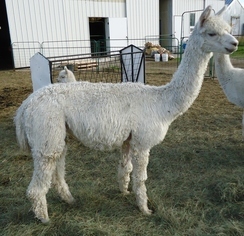 His cria are fabulous, nearly always darker than the dam's color but always dense, glistening with luster, superbly fine. They are already winning championships. In 2010 and 2011 he has produced several champions like Excalibur, Sumbawa, Holokai and Blue Ginger who won Futurity Championships.